Mosaic Consider Mosaic! An ultimately unique way to enhance and enrich any room of your home.At the “SheGon Studio”, we custom cut and glaze every clay tile to suit your individual style & color needs. 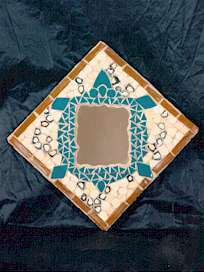 Let the permanence of mosaic design adorn your entrance, kitchen, bathroom, mantle, headboard or wherever you choose to accentuate as somewhere truly special. No two projects will ever be duplicated! Watch for the beautiful entrance mirrors at various locations in Rossland.